SCOTTSDALE, AZ--(Marketwired - Jan 13, 2015) - Guardian 8 Corporation, a wholly owned subsidiary of Guardian 8 Holdings (OTCQB: GRDH), announced today that it has surpassed its 100th pilot account for implementation of its Enhanced Non-Lethal (ENL) Pro V2 device. The Pro V2 was designed by Guardian 8 to fill a need in professional security for a multi-function tool that provides incident recording, non-lethal layered defense, and two-way communication. "This significant milestone comes just one year after we first went to market with the Pro V2," said Guardian 8 President Steve Cochennet. "It represents a significant effort to bring this revolutionary new product to market that targeted 66 different industries and resulted in narrowing to the top five potential sectors." The top target sectors that have begun adoption of the Pro V2 are hospital and health care facilities, security providers, public venues such as entertainment and hospitality, university campuses, and government service providers. The latter was recently secured through a sole source partnership with ADS Tactical to provide the Pro V2 product line through the GSA Schedule 84. "What is outstanding is that these top 5 sectors are following a process of changing the way they secure their worlds," said Paul Hughes, Guardian 8 COO, who has overseen the training of 160 certified Pro V2 instructors. "First, they develop their own in-house experts through our Train the Trainer course. Next, they purchase and evaluate the Pro V2. The Guardian 8 teams supports the client's unique policy development, and then full implementation of a security force equipped with the Pro V2 can begin." Last year, a hospital security team using a Pro V2 successfully de-escalated an incident with a threatening patient. 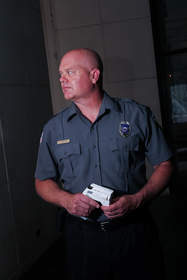 A Platinum Event Services security team working the Cotton Bowl in Dallas, TX, used their Pro V2 units to stop a crime in progress and avert a false claim of excessive use of force. Such statements are based on expectations, estimates and projections at the time the statements are made that involve a number of risks and uncertainties which could cause actual results or events to differ materially from those presently anticipated. Such statements involve risks and uncertainties, including but not limited to: any implied or perceived benefits resulting from the over 100 pilot accounts; actual acceptance of the Pro V2 device in any of the top five target markets; actual purchases of the Pro V2 device; Guardian 8's and its subsidiaries business prospects; the ability of Guardian 8 to execute its business plan; benefits of the G8 Pro V2 device; any other effects resulting from the information disclosed above; risks and effects of legal and administrative proceedings and government regulation; future financial and operational results; competition; general economic conditions; and the ability to manage and continue growth. Should one or more of these risks or uncertainties materialize, or should underlying assumptions prove incorrect, actual outcomes may vary materially from those indicated. Security Officer from Platinum Event Services equipped with the Pro V2, a new intermediate defensive option that is non-lethal.